« See What People Are Saying About Us! A-Pro home inspections benefit all 3 parties to a home sale buyers, sellers, & real estate agents. Easy to understand home inspection reports in 24 to 48 hoursAny questions at all, just call! 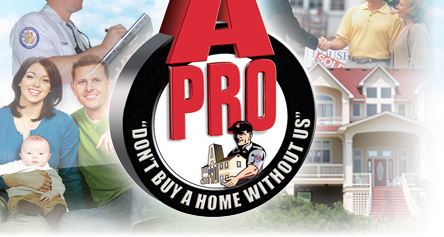 Call 1.800.793.APRO (2776) or click here to find an A-Pro”CHI” certified home Inspector. This entry was posted on Saturday, August 7th, 2010 at 4:16 pm	and is filed under Uncategorized. You can follow any responses to this entry through the RSS 2.0 feed. You can leave a response, or trackback from your own site.